Here’s a nightmare: It’s Thanksgiving morning and you forgot to thaw the turkey. Don’t worry. A turkey roasts beautifully even in its frozen state. Yes, it takes longer. But the skin will get browner and even crunchier, a definite plus. 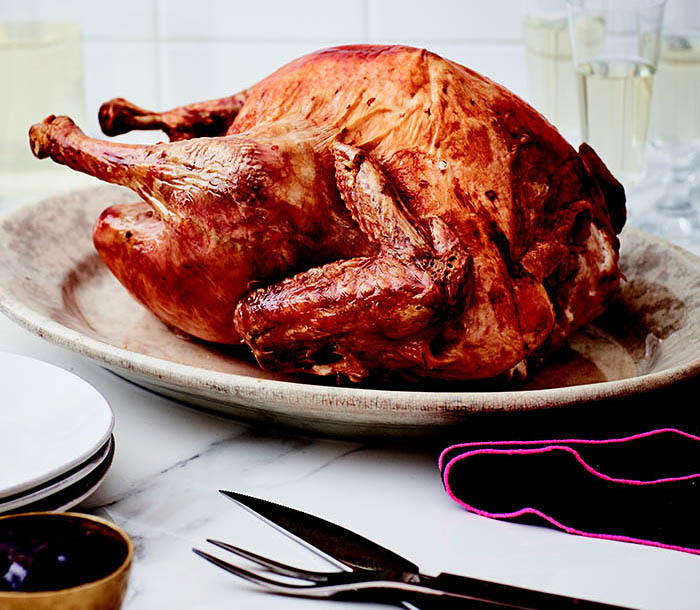 Or if it’s a long way from the holiday but you’ve got unexpected houseguests coming this weekend, pick up that frozen turkey at the market and roast it tonight. You’ll have sandwiches for days! 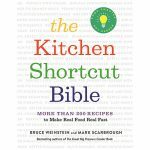 Excerpted from THE KITCHEN SHORTCUT BIBLE Copyright © 2018 by Bruce Weinstein and Mark Scarbrough. Used with permission of Little, Brown and Company, New York. All rights reserved. Hot juices can pour out of a cooked bird. Send any children or dogs out of the room for step 4. And do note: some turkeys have been injected with various brining solutions—and a few of these contain gluten or gluten-based additives. Most of the big brands are gluten-free, but check the labels to be sure. Position the rack as high as it can go in the oven and still accommodate the turkey, probably around the bottom third. Heat the oven to 325°f. Unwrap the frozen turkey and place it breast side down on a roasting rack inside a large roasting pan. Roast for 2-1/2 hours. Use kitchen tongs to find and remove the giblets and neck inside the bird. If they’re still stuck inside the bird, continue roasting, checking every 15 minutes until you can remove them. Once the giblets are out, tip the bird to allow any hot juices to run out into the roasting pan. Turn the bird breast side up. Brush the breast with the melted butter. Season with the salt and pepper to taste. 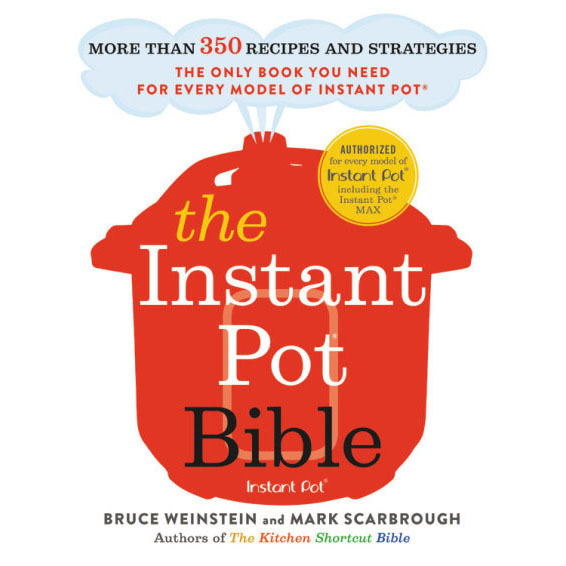 Continue roasting, adding a little broth or water to the pan if it dries out or the drippings are burning, and tenting the bird loosely with aluminum foil if it browns too deeply, until an instant-read meat thermometer inserted into both the thigh and the thickest part of the breast (without touching bone) registers 165°F. Transfer the (hot!) 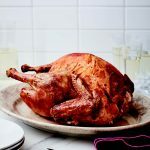 turkey to a carving board and let stand at room temperature for at least 20 minutes or up to 45 minutes before carving. All poultry may be “injected with no more than ten percent of a solution containing.…” Read the labels. If so, the chicken or turkey has been (sort of) brined and cooks up juicier, although you’re also paying upfront for additional water weight. If you buy either injected or kosher birds, consider omitting the salt from any recipe and passing extra at the table. My little dog has health issues not to mention being very picky. I often get frozen bone in turkey breasts. I put in in my slow cooker without anything else and put it on low for 8 hrs. The turket comes out delicious and healthy. I admit I eat it too.